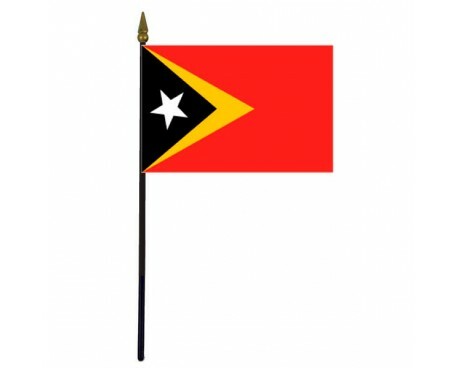 Timor-Leste Stick Flag - 4x6"
The Timor-Leste flag represents a nation that remembers its colonial past while also striving to move past it. The design combines images that represent the country's history while also including those that represent hope for the future to create a flag that represents the national character of East Timor. The flag of East Timor is one of only a few flags that has ever represented the nation in any capacity, and it is the sole Timor-Leste flag that has been used to represent it as an independent nation rather than as part of another country. The flag of Timor-Leste (also known as East Timor) was adopted in 2002. It is the same as the 1975 flag. At midnight on May 19, and during the first moments of Independence Day, 20 May 2002, the United Nations Flag was lowered and the flag of an independent East Timor was raised. As per the Constitution of the Democratic Republic of Timor-Leste, the yellow (PMS 123) triangle represents "the traces of colonialism in East Timor's history". The black triangle represents "the obscurantism that needs to be overcome"; the red (PMS 485) base of the flag represents "the struggle for national liberation"; the star, or "the light that guides", is white to represent peace. The flag of East Timor has a bright red field that is decorated with two triangles that stretch out from the hoist. The larger of the two triangles is yellow, while the smaller triangle is black. A white star with five points is placed in the center of the black triangle. The red field was chosen to represent the nation's struggle to gain independence from foreign rule, while the yellow triangle was selected in order to represent the remnants of colonial influence that can still be felt within the country. The black triangle represents the dangers of obscurantism, while the white star represents peace and the light that guides the nation of East Timor to a brighter future. 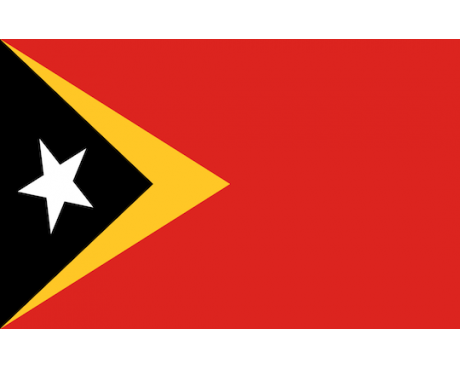 East Timor did not have a flag until it became part of the Portuguese Empire. The earliest form of the flag began to represent the country in 1702. A variant of the Portuguese flag was proposed to represent East Timor in 1965, but it was never approved by the government of Portugal. The nation declared its independence and adopted the current flag in 1975, but it was in use for only a short time before the nation came under Indonesian occupation. East Timor gained a new flag to represent it within Indonesia in 1976, and it used that flag until 1999. The flag of the United Nations came into use at that time while the nation transitioned to full independence once again, and it was replaced with the current flag when the process ended in 2002.